Why am I not surprised? Most of the Twitter Tweets supporting Wendy Davis blocking the Texas Pro-Life bill came from OUTSIDE OF TEXAS. 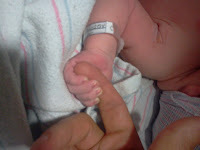 She does not represent the majority of Texans who are against killing innocent babies. She has to get her support from liberals outside of Texas! 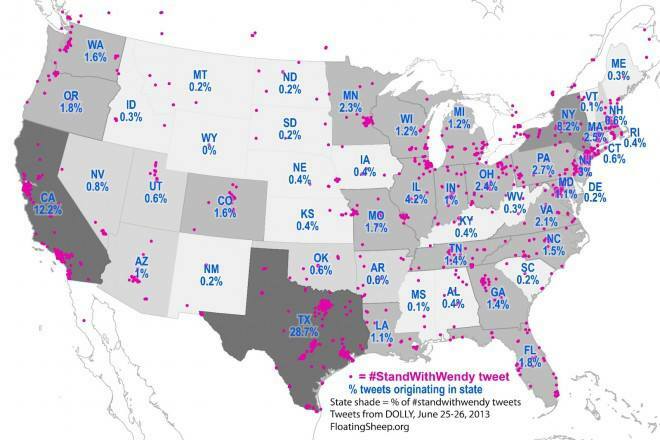 The map above, created by the academic research group Floating Sheep, shows that while the volume of Twitter activity for #StandWithWendy was—naturally—greatest in Texas itself (nearly 29 percent of all tweets), there was also quite a bit of chatter coming out of places like New York state (8 percent), California (12 percent) and even places like Illinois (4 percent). That should tell you everything you need to know about the 'emerging groundswell in Texas' narrative. This is HUGE News! 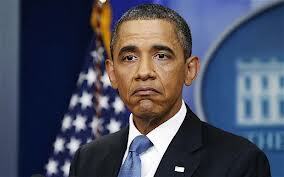 The 10th Circuit Court of Appeals has blocked the Obama Administration from enforcing Obamacare onto Hobby Lobby. Hobby Lobby was about to be hit with huge fines after the Christian Owners of the business decided to refuse implementing Obamacare. Hobby Lobby objected to being forced to pay for abortions and contraception because it violates their religious beliefs, which is what they would be required to do under Obamacare. Hobby Lobby WON. This is great news because it shows that, although Obamacare was upheld as a tax, it can be successfully challenged on other grounds such as it violates the First Amendment and Freedom of Religious Expression. (CNSNews.com) – Following on yesterday’s 10th Circuit Court of Appeals ruling that Hobby Lobby can continue its lawsuit against the Obama administration’s contraception mandate on religious grounds, the U.S. District Court for the Western District of Oklahoma ruled today that the federal government must halt all enforcement of the mandate (and related financial penalties) against the Christian-based company. Hobby Lobby and sister company Mardel are suing the Department of Health and Human Services and Secretary Kathleen Sebelius, arguing that to force the company to pay for health insurance that must offer abortion-inducing drugs, as well as sterilization and contraception, is a violation of its religious liberty. In his order issued on Friday, U.S. District Judge Joe Heaton said the “court concludes plaintiffs [Hobby Lobby] have made a sufficient showing to warrant the issuance of a temporary restraining order in the circumstances existing here." "Accordingly, the defendants [Sebelius and HHS], their agents, officers, and employees are temporarily ENJOINED and RESTRAINED from any effort to apply or enforce, as to plaintiffs, the substantive requirements imposed” by the mandate," said the judge's order. Further proceedings in the case are scheduled for July 19, 2013, in Oklahoma City. Earlier this week, Texas senator Ted Cruz pledged to block State Department nominees until the federal agency filled the vacant inspector general position. Almost two days later, the State Department nominated Steve Linick for the position, which has been vacant for nearly 2,000 days. "The President's failure to nominate a State Department Inspector General since taking office in 2009 is unacceptable. The position has been vacant for almost 2,000 days. This is a crucial oversight position and should be a priority for an agency facing substantial management challenges," Cruz said in a statement released Wednesday. "Until the President acts, I have notified Senate Majority Leader Harry Reid and Minority Leader Mitch McConnell that I will place a hold on all State Department nominations." 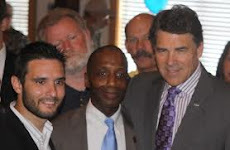 Governor Perry Calls Second Special Session for Abortion and other things. Mob DOES NOT Win! Legislation relating to the regulation of abortion procedures, providers and facilities. Legislation relating to the funding of transportation infrastructure projects. Texas LT Governor David Dewhurst has partially blamed a mob for the failure of big Texas Special Session Pro-Life bills and he partially blamed The Texas House, under the leadership and scheduling of pro-choice Texas Speaker Joe Straus. Dewhurst says that the Senate did not get the bill from the House in time to pass it in the Senate. They had all Special session to pass the bill and the Texas Senate had a plan from the beginning but the House leadership drug their feet. This is exactly what I have been saying all along! Straus has sabotaged all the pro-life bills this year. He killed the bills in regular session and in the special session he waited till the last minute to get the bills to the Senate so that there was not enough time for them to pass. He did the same thing with the big anti-TSA bill last session. There will likely be a second special session called by Governor Perry to pass these pro-life bills. Today, the Supreme Court recognized the enormous progress made toward voting equality in the United States since the Voting Rights Act was passed in 1965. The Court rightly decided that the statutory standards used decades ago to subject democratically-elected state legislatures to second-guessing by unelected federal bureaucrats no longer survives constitutional scrutiny. Today's decision also validates the hard work and personal sacrifice made by my late friend and former Texas solicitor general, Greg Coleman. Greg's tireless and brilliant advocacy on this issue no doubt paved the way for this result, and I am grateful for his principled legacy. The Supreme Court of the United States has declared a key provision of the Voting Rights Act. I have long declared and written many articles explaining why Section 5 of the Voting Rights Act is racist, discriminatory and unconstitutional. SCOTUS did not strike down Section 5, but they effectively dismantled Section 5 by striking down Section 4. Section 5 of the voting rights act requires certain states and counties to get preclearance from Eric Holder's racist Department of Justice before they can make ANY changes to anything involving elections. Section 5 was not struck down, but section 4 was. Section 4 is the formula that determines which states and counties get singles out for Section 5 preclearance. Because the formula was thrown out, section 5, although not voided, is completely disabled until Congress votes to creates a new formula to replace the unconstitutional formula that was just thrown out. This ruling means there is currently NO MORE DOJ PRECLEARANCE required and anything that is pending review by the DOJ can go into effect. Texas can redistrict without oversight by Holder. Other states get to redistrict without oversight and it was discriminatory to require Texas to get Holder's approval first. South Carolina can implement their voter id law and so can Texas. It was wrong to allow other states to have the same voter id law but block South Carolina, Mississippi, Alabama and Texas just because Eric Holder wants to. Texas GOP no longer has to be forced to keep the Republican Primary election the way Eric Holder wants it. We can now make our own primary election dates and procedures. When I was a State Republican Executive Committeeman I argued for standing up against the DOJ and even said we should sue them because what they were doing was unconstitutional.Needless to say the party just went along with the DOJ and didn't stand up to them. Oh well. Thankfully some people did stand up to the DOJ and that led to the Supreme Court issuing this ruling today. This is a huge win for equality and ending racism and discrimination. ALL races have been able to freely vote in any and all elections for decades and the law was very outdated and no longer useful. For far too long the DOJ Preclearance was used to promote certain races over others in elections. Chief Justice John Roberts argued that these states and the conditions in them have "changed dramatically" over the years. "The tests and devices that blocked ballot access have been forbidden nationwide for over 40 years. Yet the Act has not eased (Section 5's) restrictions or narrowed the scope of (Section 4's) coverage formula along the way. Instead those extraordinary and unprecedented features have been reauthorized as if nothing has changed, and they have grown even stronger," he wrote. “The U.S. Constitution establishes one United States — not a divided nation with different laws applying to different states. Laws that apply unequally to just some states have no place in our nation. Today’s ruling ensures that Texas is no longer one of just a few states that must seek approval from the federal government before its election laws can take effect. “Today's ruling does not abolish the Voting Rights Act. All states, including Texas, continue to be subject to Section 2 of the Voting Rights Act and the U.S. Constitution, which prohibit racial discrimination nationwide. "Today, the Supreme Court recognized the enormous progress made toward voting equality in the United States since the Voting Rights Act was passed in 1965. The Court rightly decided that the statutory standards used decades ago to subject de...mocratically-elected state legislatures to second-guessing by unelected federal bureaucrats no longer survives constitutional scrutiny. Today's decision also validates the hard work and personal sacrifice made by my late friend and former Texas solicitor general, Greg Coleman. Greg's tireless and brilliant advocacy on this issue no doubt paved the way for this result, and I am grateful for his principled legacy." did at a Kindergarten graduation. The principal, Kevin Wing, is one of the best principals running one of the best schools in Lumberton. Wing asked the parents if they mind if he said a prayer for the safety of the kids over the summer. That was it. Fortunately, this Christian prayer incident is not likely to cause any anger in Lumberton, TX. In fact, he will probably get an thank you from many parents who would like to see more prayers in school to combat the moral decline that we have seen over the years in America. He certainly should not get in trouble. If a teacher can walk around the school with a Vote Obama shirt on and not get into trouble, and if a different teacher can ask students to wear Muslim Burqas and not get into trouble, then it would be discriminatory to punish this principal for a simple school prayer. I didn't even call for the teacher involved in the Burqa incident to get disciplined, I just thought the lesson was a bad idea and should not be allowed. Teaching about religions and other cultures is ok, but having them wear a religious garment goes too far, especially since it was not taught that women could be killed in Muslim countries if they do not wear the Burqas. With that being said, this principal who said a prayer should not get into ANY trouble. It is interesting that the Freedom from Religion Foundation had no problem with students wearing Muslim Burqas at Lumberton Texas Schools but they have a problem with a prayer at a graduation.... obvious hypocritical double standard! Contrary to what Liberals, Atheists and the Freedom from Religion Foundation says, prayer in school is not illegal. Every once in a while these groups will sue and try to take "Under God" out of the Pledge or prayer out of the public arena because they somehow think having to hear the words Under God forces them be believe in God. They cry out about government not being able to establish a national religion but they forget about government also not being able to prohibit the free exercise thereof. I do understand things are a little different at schools because staff have a position of authority over kids who are learning. Because of this, school staff generally should not get involved in leading prayer or religious activities at school. It is not illegal but it might get the school involved in a lawsuit if a parent wants to sue to stop prayers from happening. That being said, STUDENTS CAN PRAY in schools and at school public events. Principal Wing did not pray in a classroom setting. He was not with the kids by themselves in a learning environment. He was with the parents and did not try to push any religion. He only asked for protection for the kids. No big deal, just don't do it again, nothing to see here, move along. Do not give in to the Atheists though, Principal Wing should still have the prayer, but NEXT TIME JUST LET ONE OF THE KIDS PRAY. Liberals and Atheists get mad when school staff pray but they can't do anything about a kid praying at the graduation. In east Texas, prayer at just about every public meeting, sporting event, and graduation is the norm There is nothing illegal about it. Prayer has been a pillar of just about every public event and even government meetings since the founding of the United States of America. We even get our rights in America from our "Creator." "Yes I was there for my son.....he said if y'all don't mind I want to say a little prayer for these children...the we all bowed and he said a simple prayer like..protect the children this summer, be with them through their educational journey and for parents and teachers as we bring them up....very short and sweet and then we all said pledge which of course says one nation under God"
Not long after the graduation, LISD received a letter from the Freedom from Religion Foundation threatening the school over the prayer. They said they got a complaint from an anonymous parent, but it is more likely that there was no complaining parent and the organization just heard about the prayer and decided to attack. This organization sends letter like this all the time and they typically get shot down. Freedom from Religion Foundation just lost in court right down the road from Lumberton in Kountze, TX when they tried to not allow students to put Bible verses on signs that the students make. They do not care about the Constitution, they only care about destroying Christianity the Constitutional right of religious expression. Bottom line, there is nothing illegal about what happened at the Lumberton Kindergarten graduation. The principal should not get into trouble. It was a one time event and from now on the principal should just make sure it is a student praying instead of the principal so that thee liberal nuts do not come after the school. Thanks Principal Wing! The residents of Lumberton, TX support you! Recently, the Lumberton ISD was in the news because of a lesson that involved students wearing Muslim Burqas. This lesson did not sit well with parents in the school district. The Burqa incident even led to national scrutiny of other, unrelated curriculum lessons being taught all across Texas called CSCOPE. The CSCOPE curriculum contained everything from anti-American lessons to seemingly pro-communist and pro Islam lessons. Needless to say, CSCOPE did not stand a chance after outraged Texans and even the Legislature came after it. CSCOPE eventually pulled all of the lessons, but there is belief that the lessons will still be pushed into Texas schools via other online programs that are not transparent. The IRS sent more than $46 million in tax refunds to 23,994 “unauthorized” alien workers who all listed the same address in Atlanta, Ga., in 2011, according to an audit report by the Treasury Inspector General for Tax Administration (TIGTA). However, the Atlanta address that received millions of dollars in refunds was not the only address apparently housing thousands of “unauthorized” aliens. In fact, it wasn’t even the only address in Atlanta that was claiming such a situation. The TIGTA audit report, published last year at the request of members of Congress, revealed 10 addresses in the U.S. that were issued anywhere from 1,846 to 23,994 tax refunds each. Four of those 10 addresses were located in Atlanta.